We make every effort to ensure your experience purchasing from Becker Furniture World or Becker Mattress is pleasant and satisfying. All merchandise is warranted against manufacturer’s defects for one full year from date of receipt. Please inspect your purchase carefully upon receipt. If you find visible defects on your furniture, you must call our Service Department within 5 days of receipt and notify us of the concern (within 24 hours for mattresses). Beyond one year we will be happy to service your product for nominal service fees and transportation costs. Accessory items, such as pictures, lamps and mirrors, cannot be serviced. Please inspect these items before leaving the store. Have a sales or service related question? In order for our Service Department to fill your needs and expedite your request, please have your sales receipt available. 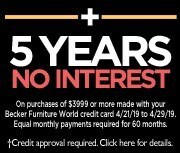 Becker Furniture World and Becker Mattress reserve the right to inspect damaged merchandise in your home, provide service in your home or our warehouse, and repair or replace the part or merchandise at our discretion. 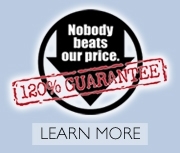 Becker will work with you and the manufacturer to support any warranty claims. Upholstery-fabric dye lots and fabric swatches may vary in shade from the product actually delivered by the manufacturer. 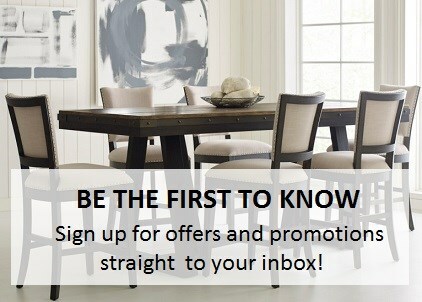 Becker Furniture World is not responsible for any dye lot variances or pilling of fabrics. Natural materials such as wood and leather have unique variations that add to the natural beauty of the product and should be expected. Becker Furniture World cannot be responsible for uniformity or perfection in these natural products.